Oregon’s happy Republican warrior, Dennis Richardson, a State Representative from Central Point, has made a video (see below) outlining a plan to help Oregon’s rural communities and at the same time help our forests. It’s a good plan. Oregon’s cadre of radical lawyers teaching in our law schools and populating the enviro law fare machine will probably kill it. Environmentalists have used Oregon’s trees as a testing ground for dubious legal claims for decades now. They’ve gone to court to stop logging renewable crops of trees to ‘protect’ spotted owls, old growth, salmon and watersheds. They’ve outlawed roads to keep people out of the forests because they might start forest fires. They’ve taken their enviro-religion, put the imprimatur of legitimacy on it by going to law school and expect the rest of us to swoon at their cleverness. The impact their legal success sadly has had a devastating impact on another species: humans. The effect has all but financially ruined many of Oregon’s foresters, loggers and millers. The environmentalists couldn’t be happier about it. This devastation has been done intentionally over the years in the name of global cooling, ozone holes, greenhouse effects, global warming and climate change. With each new fad comes a new wave of scary predictions. Of course their predictions didn’t include the news that in fact spotted owls don’t need old growth forest to live. That spotted owls were actually being picked off by barred owls. Their predictions didn’t mention that if you let a forest fire burn, then their hated CO2 stored in the trees will be released into the atmosphere and cause cooling, holes, warming or change. That trees have a life cycle and die like every other living thing and when they do start circling the drain, release all the CO2 the enviros claim will cause us to burn up and die. That when you don’t manage forests and allow other species to invade them, it makes ALL the trees more susceptible to fires and insect devastation. That when when their goddess Gaia (Mother Nature) started a forest fire they’d battle in court to prevent it from being fought and then go to court again to stop loggers from salvaging what was left over. I think the enviros have done some good. I like clean air and water. They should take a victory lap for that. However, when they start making wild claims (see owls, trees, LNG and coal trains), plant a protected flower on the site of a reviled California development project and tamper with water samples to frame a Hood River business owner, then they should be laughed out of polite society and ordered to sit in the dunce chair with the rest of their Democracy Now! and Earth Liberation Front fellow travelers. Now we’re left to argue over the scraps of Oregon’s once mighty timber industry. 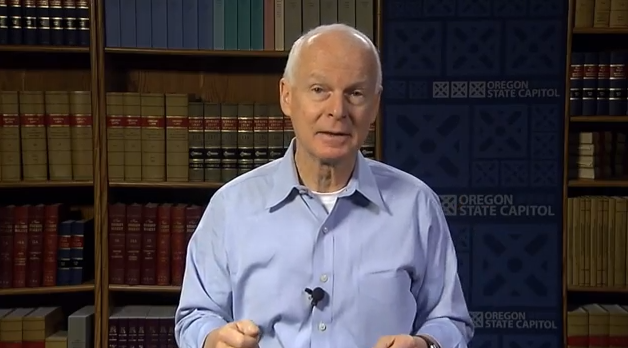 Representative Dennis Richardson has a plan to reclaim part of the economy that environmentalists have sought to close off. He deserves to be heard. Whether he will be is up to you.